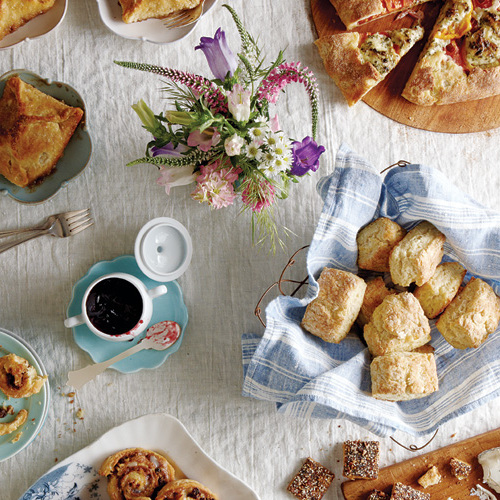 This versatile dough comes together in minutes and can be used to make not only biscuits but many other tasty treats, too, depending on how you roll and cut it—see Buttermilk Biscuits, Heirloom Tomato and Cheese Pie, Sesame-Poppy-Pecan Crackers, Cinnamon-Raisin-Walnut Pinwheels, and Maple-Peach Dumplings. Buttermilk has a tendency to separate a bit in the carton, so be sure to shake it well before measuring. In a large, wide bowl, combine the flour, baking powder, sugar, baking soda, and salt. Using a pastry blender or your fingertips, cut in the butter until the mixture resembles coarse meal with some pea-size lumps. Using a silicone spatula, stir in the buttermilk just until the flour mixture is moistened. Do not overmix; the dough should just come together, and it will be sticky. 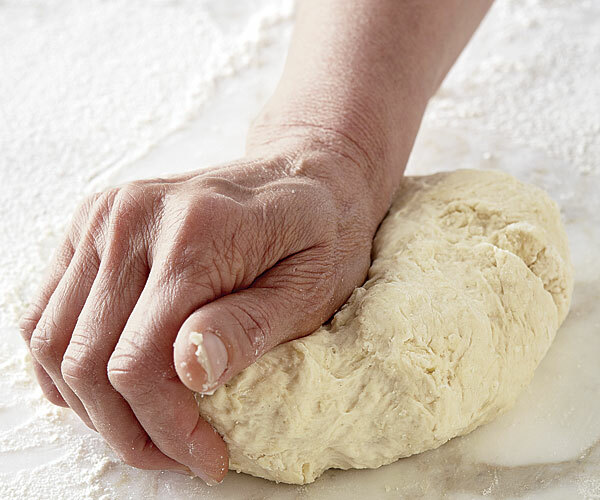 Transfer the dough to a floured work surface and gently knead 6 to 8 times, dusting lightly with flour if needed to keep it from sticking. The flour and butter mixture can be refrigerated in a zip-top freezer bag for up to 1 week, or frozen for up to 1 month. If frozen, thaw at room temperature for 30 minutes before proceeding with the recipe. Love this recipe! It is the base for my pizza pie, gaining its inspiration from the Heirloom Tomato and Cheese Pie. I mix a little Italian seasoning blend and garlic powder into the dough mixture, roll it out, and in the center heap a mound of turkey Italian sausage, pepperoni slices, and various other pizza-like toppings along with stirred-in pizza sauce. Then I top it with Queso Oaxaca, Mexican mozzarella cheese, slices before enrobing it with the folds of the dough. Bake, cut, and enjoy. It's a family fave! Very quick and easy. Tasty without and excessive amount of butter. I have not made these yet, but I wondered if this dough could be used to make steamed dumplings. I will rate it as 4 stars, which is its current rating.